AHS Heating Services is an approved Viessmann partner. Established in 1917, Viessmann draws on more than 90 years’ experience in the development and manufacture of heating systems and due to its high commitment to quality, it is Europe’s single largest brand in heating technology. Viessmann is a third generation family business and as such is able to hold true to its principles of innovation, efficiency and sustainability; this is a significant reason behind Viessmann’s continued success. 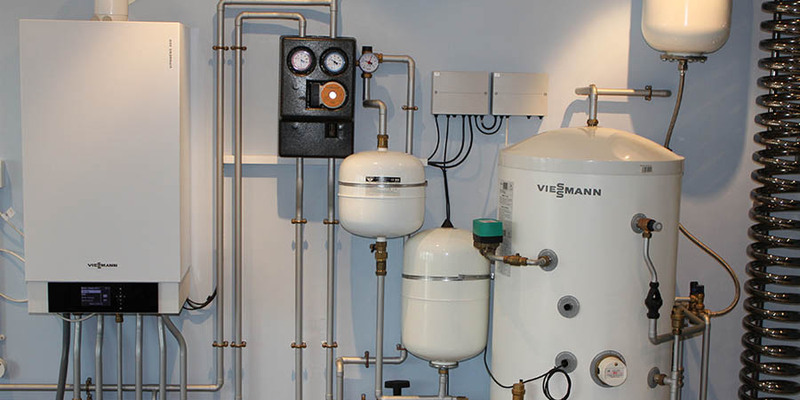 Viessmann produces products in the follow sectors; high efficiency boilers, both domestic and commercial, solar thermal flat plate and tube collectors and PV panels; air source and ground source heat pumps; biomass boilers; and CHP units for commercial/domestic use, using a number of fuels including biogas. With ever increasing fuel bills and the need to be as eco-friendly as possible, it’s important that we all look for ways to save fuel and carbon emissions – and money! All boilers now have to be condensing boilers and this represents a huge step forward in environmentally friendly heating, with fuel savings of up to 35% compared to conventional boilers. But there is a way to save even more – up to 15% in fact, with just a simple outdoor sensor and some very clever Weather Compensation controls, available with the Vitodens range of condensing boilers. For a relatively small investment you’ll not only save up to 15% more fuel each year but you’ll also enjoy a comfortable home – with a pleasant indoor temperature – whatever the weather. Alexandra Heating Services Ltd assist Viessmann UK with their warranty works throughout the South. Our engineers are Viessmann trained, with a wealth of experience giving them excellent diagnostic skills as they know these boilers inside out. Making AHS Ltd the best choice to help you out with you Viessmann boiler. There are so many reason to choose Viessmann and we are proud to be a part of the innovation and technology that they bring to the UK. Our sister company Viessmann Direct also based in Salisbury, holds stock of thousands of essential spares for both domestic and commercial sizing, and for both oil and gas boilers. Our Salisbury base offers training facilities for in-house staff and external engineers on the full range of Viessmann boilers to include small commercial and domestic boilers, unvented systems, hot water systems and a range of renewable energies. It is also a great opportunity for customers to come and take a look at and listen to the products in action!